I tried a new exposed spine binding this week since Jackie's weekly challenge this week is "Exposed." This is an unsupported blanket stitch. 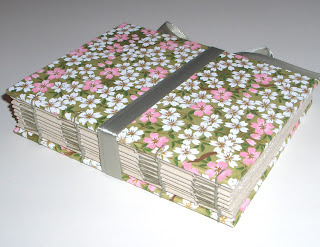 It is my first attempt at this binding and the result is a rather floppy structure overall. I prefer when the sections and covers stay aligned better. This book is only about 13cm high (5") so I thought four sewing stations would be sufficient; but, perhaps additional sewing stations would make it more stable. Any suggestions? I think adding supports would be the best solution - and I think I'll try that next. 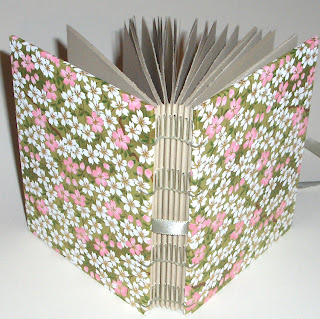 I love to see books that other people are making - and of course Jackie's TJBookArts Flickr group and weekly challenge are open to all. It would be super to see more people sharing their book photos on there!